A young man named Baron “Scooter” Pikes was abducted on January 17, 2008 by people the town of Winnfield, LA call “police.” Mr. Pikes was subsequently handcuffed and while subdued, a radical Christian terrorist named Scott Nugent, one of these police, shot Mr. Pikes 14 times in nine minutes with a Taser electrocution device, killing the young man. Winn Parish D.A. R. Christopher Nevils ultimately charged the killer with only “manslaughter,” and also became the killer’s best defense attorney, AS THE PROSECUTOR. Nugent, of course, was acquitted of all charges in October 2010, after Nevils put on a display which likely won him a lifetime position as D.A. if he so chooses. We all know politicians nowadays who do anything to hurt non-Europeans, are heroes and shoe-ins to win GOP political positions. It was easy to predict (as we did) that Nugent would face no consequences for killing “a black” in Louisiana or anywhere else in the Confederacy. Nevils will not be disbarred, arrested, or even reprimanded for openly advocating for a defendant as the state prosecutor. Nevils not only advocated for the removal of all “black” jurors from the jury pool, but also committed an egregious Brady violation. Nevils banned Winn Parish coroner, Dr. Randolph Williams, from the murder trial. Dr. Williams ruled Mr. Pikes death a homicide and confirmed there were no drugs in his system when he died. Of course Winnfield “police” lied about this, said Mr. Pikes was hopped up on drugs, and Nevils went with it. (NOTE: State-run Euro-American media in Louisiana called “thetowntalk.com” removed a story they initially wrote which we linked for a source of Nevils stating “all black jurors are tainted,” and excusing them all as potential jurors from the Nugent murder trial. You may also read about this here from another source via the Wayback Machine). This incident would become a major water cooler topic for Winn Parish residents over the next few months; some calling for Nevils’ resignation; others defending their prosecutor’s criminal acts, and subsequent de-facto pardon he received. Nevils had a high-profile case at his disposal (Nugent trial) and all the political stars lined up for him to save face. All Nevils had to do was prove he is a true Confederate thug to get back in the good graces of the Winn Parish citizens; by aiding in the acquittal of a white cop for killing a young black man. It was a political move by him. Nevils, however, may have destroyed his newly invigorated admiration by Winn Parish citizens only a few months after he earned his whiteboy badge of honor. Last Wednesday, state police executed search warrants at the home and office of Winn Parish Sheriff A.D. “Bodie” Little, as part of a four month investigation by the Louisiana Attorney General’s Office. Though early reports as to what the investigation entails are lacking in details, Little was the subject of a January 2008 lawsuit filed by a group of taxpayers. 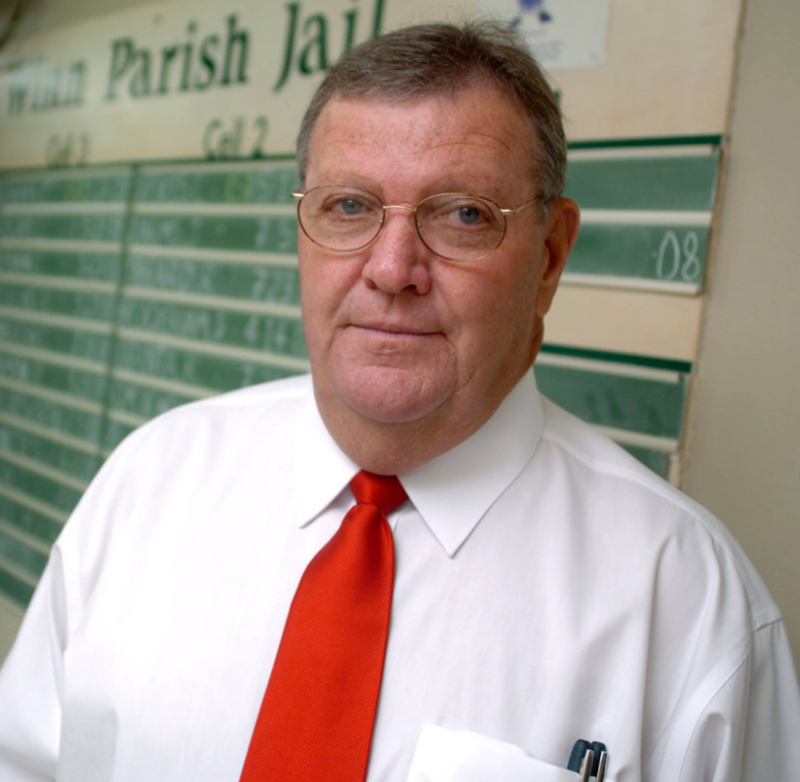 Little, who was the Winn Parish Tax Assessor before assuming the Sheriff’s position in July 2008, increased taxes for all his political enemies, including individuals who voted against him for Sheriff, according to the lawsuit. Little was investigated by the Attorney General’s Office in 2004 as well, on charges he gave himself, as parish tax assessor, two homestead exemptions without exhausting the proper legal channels. The prosecution never came to fruition since the Winn Parish D.A. at the time, Terry Reeves, killed himself (or was murdered…no ones really knows), and of course, Nevils replaced him and halted the investigation. Based on the foregoing, it is reasonable for Winn Parish citizens to now wonder why Nevils recused himself from the investigation. He cited “ongoing personal issues” with the Sheriff, according to a KSLA News 12 report. Nevils can somehow, in Louisiana, hand out jail time and fines to people charged with DWI, yet he is charged with the same (along with hit-and-run) and faced no punishment. Now it appears Nevils and Sheriff Little are in bed together (figuratively, that we know of right now) and it appears it is all hitting the fan at once. 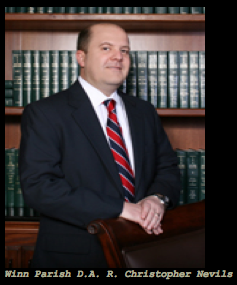 Nevils should be disbarred if the Louisiana State Bar has any sort of integrity; and his criminal charges need to be brought back to the table and adjudicated by an unbiased, out-of-state prosecutor and court. None of this will happen, however, which is further reason why Eleventh Amendment absolute immunity for prosecutors must be repealed. If you are black in Winn Parish, you are a fool if you are not armed and trained to PRO-ACTIVELY use your firearms for protection against radical Christian terrorism, especially the ones who have replaced their urine-stained white sheets with badges. If you are one of those rare non-sheeple Euro-American Louisianans, I urge you to fight for Nevils’ removal from office before you are incarcerated and fined for the same crimes Nevils got away with. UPDATED 2/20/2011: Another young brother, Robert Ricks, Tasered To Death; this time by Alexandria, LA police. The murder happened on Saturday, February 5 and right now, that is all we know. Alexandria Police and the mayor have refused to answer question by city council members and the family of Mr. Ricks. We will continue to follow this story and update as we learn more. I applaud Operation Nation’s efforts to hold this murderer accountable for this disgusting crime. The prosecutor Nibbles should be imprisoned for life, just like that prosecutor who destroyed those kids’ lives in Jena. I’m ready and armed Mr. Wilkins. And you have my contact info. Salaam. Richard Christopher Nevils is attempting to railroad my son (white) in a double jeopardy pleading in the Winn Parish courtroom at 9:30 a.m. tomorrow morning. My son has already been sentenced, served his time, released on probation, and this charge had been vacated by Judge Derr because another charge was being pursued by the Federal Government. That charge is a prohibited person in possession of weapons after a guilty plea of domestic violence in Alabama in 2002. That charge is not valid due to the way it was handled in Alabama, however, Judge Drell, in Alexandria, LA, refuses to rule on the Boykin, and my son, Jean Paul Stroud has been in prison without trial since November 2010. Now, his trial date, set for October 31, 2012, has been postponed until November 27, 2012, under the pretense of obtaining a new government attorney for him ( he has fired two). Actually, we believe the postponement is because Mr. Nevils wants to assist the government in bringing up the previous plea and sentencing in order to enhance the sentence in my son’s upcoming Federal trial. “good old boy” scenario. This parish is overwhelmed with drug dealers, ineffective law enforcement, and a police force as corrupt as any in the Country. The police force actually supports the drug dealers here, and they threaten the lives of the citizens here who try to report the dealers and better the lives for the people in this area. I have written everyone from the Governor to the President in the past two years attempting to change things in this community and the total abuse my son has suffered at the hands of the so called Justice System in this Country. Nothing has ever come of any of it. I don’t expect any help from you. I know you have another agenda, however, I did get some of this off my chest before I have to appear in the Winnfield courtroom tomorrow to witness an even more horrific injustice meted out to my son. I lived in Winn parish for many years. I moved out of Winn Parish due to the WHITE/BLACK issues as well as the judicial system. The parish judge as well as district atternoy are very unfair to blacks. Considering that I have biracial children I didn’t want my children to go threw any unessecary racial treatment.. I completely understand fusterations with the murder case. I’m going threw my own fusterations on how obitual white female gets 8 year hard labor sentence but serves less than a year (and has 13 pending charges)and watched a black female get a two year sentence first offence offender and had to do the whole two years! WHEN WILL JUSTICE BE SERVED IN WINNFIELD!